I believe it was Yogi Berra who said, "It's tough to make predictions, especially about the future." The market has now reached a point where it clearly does not want to telegraph its next move. There are times, when the larger trend is clearly defined, that the short-term wave structure isn't an issue. This is not one of those times. The larger trend for the year is still down. The question remains: is the intermediate trend still up, or has it turned? 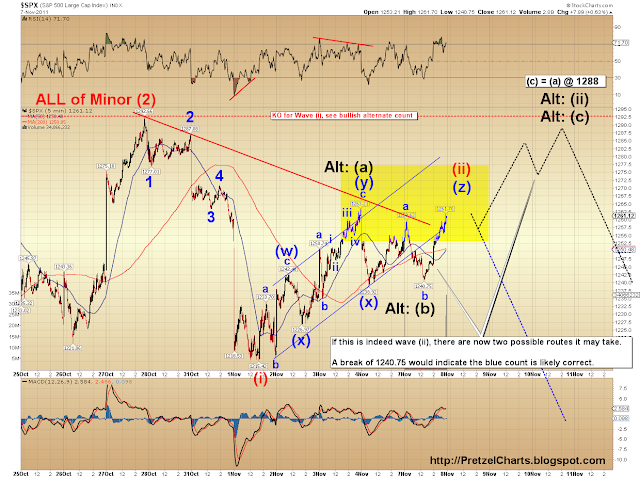 Early indications favored a turn, and I continue to believe that the top is either in, or very close. Usually when the intermediate trend becomes hazy, an examination into the shorter time-frames can reveal some answers. But after Monday's action, a short-term examination reveals total mayhem in the charts. Since the November low, the market has range-raced repeatedly, and generally refused to provide any meaningful pattern. The market appears undecided. It's as if the market is saying to itself, "Hmm. Well, Europe seems okay for the moment; but it's still a disaster over there. The economy doesn't seem terrible; but it doesn't seem too good either. The Fed seems clueless; but at least they're not doing too much damage right now. Decisions, decisions!" At this point, there are so many potentials, it is very hard to narrow the future down to one likely path. Despite that, I continue to favor the view that the next move is down. I favor this due to sentiment, and also because that's what appeared most probable the last time the market looked semi-clear. I must admit that my faith in this view has been shaken somewhat at this stage, so I've assembled a battery of charts for you to examine as well. The first chart I'd like to present is an old favorite indicator of mine, which I haven't had occasion to use in a while. 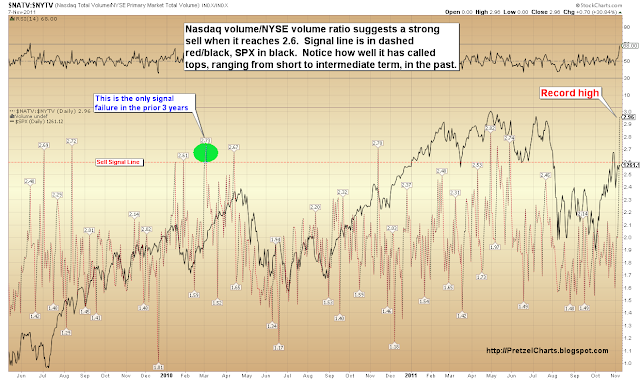 This indicator compares the volume on the Nasdaq as a ratio to volume on the New York Stock Exchange. When investors get into "risk on" mode, more money pours into the Nasdaq. As a result, the ratio is low near bottoms, where investors are behaving cautiously and putting less money into the "risky" Nasdaq; and high at tops, when investors are feeling invincible. The above indicator presents a very good argument that the top of this recent retracement rally is pretty darn close. Add that to yesterday, when we looked at Rydex funds, which are also showing sentiment is extremely frothy. The next chart is the updated Apple chart. Apple continues to look like it wants to make new lows. The red line is the knockout for blue i as labeled on the chart. I am convinced the blue "1" (below the red "ii") is an impulse wave, so I would expect if the alternate count unfolds, price should not exceed the red "ii" top. Next up, the SPX chart, which has devolved into a confusing mess, along with most of the other indices. I am favoring the view that we will see a little more upside on Tuesday to complete wave (z), of a rare formation called a "triple zigzag." I would expect a reversal soon if this view is correct. The alternate view, in black, sees the double zigzag, labeled (w) (x) (y) as having completed wave (a). Yesterday completed wave (b), and wave (c) is in progress now. If (c) = (a), that would target roughly 1288 as the high for this move. Next, the Philadelphia Banking Index (BKX). The BKX is one of the few charts that looks semi-clear right now. Interestingly, the BKX also seems to indicate that this is a fourth wave correction, not a second wave. I have labeled it accordingly. When the November decline first occurred, my instinct was that we still needed a fourth wave to complete the wave down. Although I have the retracement on the prior charts (SPX and NDX) labeled as red wave (ii), there is still nothing to rule out the fourth wave option in any of the indices. Note that the blue i and ii on the BKX chart represent the subdivisions of the larger wave 5. Assuming the market heads down in the near future, we should be able to determine whether it's the start of wave (iii) down or the end of wave (i) down based on divergences in RSI and MACD. For the fifth wave, we would expect positive divergences to develop in these indicators as new price lows are made. If it's a third wave, we would instead expect to see momentum increasing. 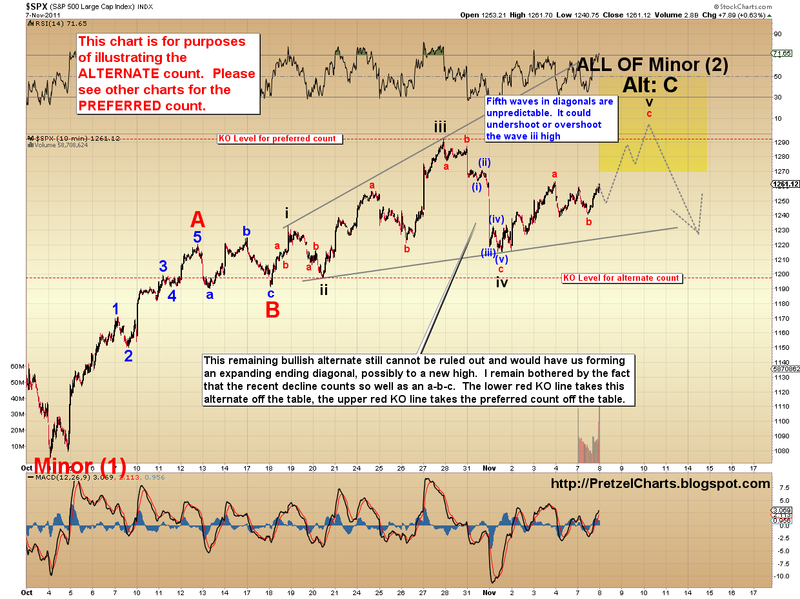 And finally, the bullish alternate count. This count continues to hang in there at 30% odds. I am not yet favoring the bullish outcome. For me to begin expecting a bullish outcome, the market is going to need to put together a stronger rally, with more impulsive looking waves than it has done so far. It's certainly possible, and I'm not ruling it out -- obviously. Ruling it out would be 0% odds. But I'm not favoring it until the market gives me more concrete reasons to do so. 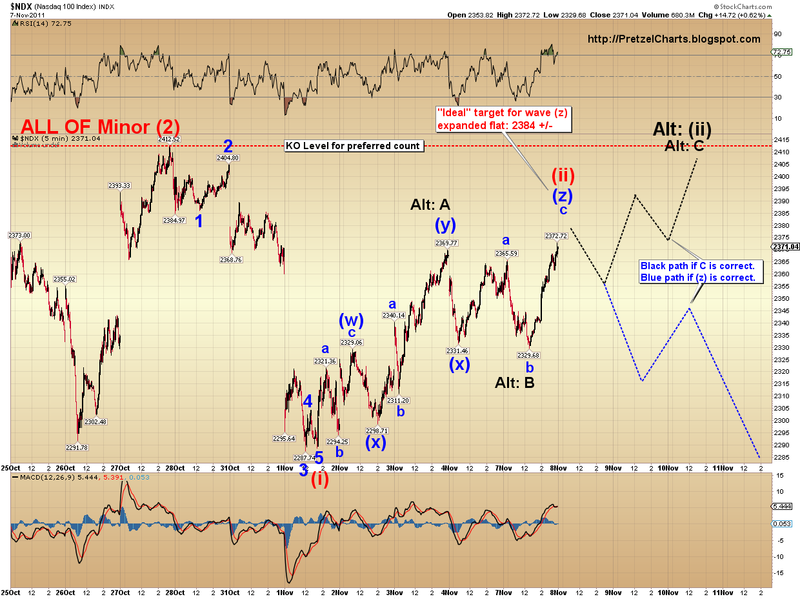 The final wave up in this bullish count could end beneath the October highs, or run as high as SPX 1330 or so. In ending diagonals, the final wave is almost completely unpredictable. Short term, the market really needs to show some more structure before we can conclusively eliminate some of these counts. I'm taking a stand anyway, and continue to favor the view that the next short-term top is very close. My preferred view is that we'll see a reversal begin at some point tomorrow; my first alternate is that we'll run up very close to the October 27 high before reversing. However, at this moment, I'm far from certain of those conclusions, and they may well be proven wrong over the next several sessions. Personally, when the market becomes this indecipherable, I don't try to front-run the move with my trades. I stay in cash until the market reveals its intentions more clearly. Trade safe. First, just had to beat Frank! lol, you win the Kewpie Doll! On the volume ratio, for the data you present, it looks like the indicator level could be set lower at 2.4 rather than 2.6. This would capture a few more tops. Man, this was a lot of work. I can't believe what time it is... one of those nights you think it's about 3 hours earlier than it is, because you've been working straight through. Looks like CTP bailed on the bear counts and is expecting a Santa Claus rally now. I admit, it's hard to stay bearish here, especially with the futures as green as they are this morning. It will be interesting to see what happens today/tomorrow. Might get the bear count blown out pretty quick. The thing that has never stopped bothering me is the way the decline off the high can count as an a-b-c.
Yeah, it'd be less reliable then, though. Look at the mess in March/April '10 for example. I see the March/April '10 premature indicators now. My eyes skipped right over those points because they did not have numeric labels. An interesting and logical indicator, thanks for sharing. Lol, Vulture, I just think it's early... I could definitely be wrong, though. The thing that keeps coming to my mind here is that the only time the market ignores indicators like extreme bullish sentiment is IN A BULL MARKET. So, then the leap goes from: either the top comes soon, or we have to start considering "serious" bullish counts. Know what I mean? Interesting SPX levels to watch. You have the bear top at 1288, and the bear count negated if SPX breaks 1292. Kissing cousins I'd day. RE: "dissin' people jumping off the bandwagon." I wasn't actually talking about anyone specifically, I was speaking generally, so hopefully no one takes it personally. I think I'll change it, just to prevent confusion. Just discovered this site, very good work, extremely nice charts and alternative insights. Thanks. Vulture, yeah things are definitely biased toward the bulls. I think, at some point on the horizon, there's a black swan event looming -- and that will knock the Fed's legs out from under them, just like in '08. Yeah, when the blog is down to 10 hits a day, it will be time to mortgage the house into puts, lol. It'll be interesting to see if the gap open gets bought or sold by the cash market. The bears aren't getting any help from the dollar, approaching it's recent lows but enough that I would expect a bounce soon to keep any equities rally in check. Dollar really looks like it's in a fourth wave sideways now. 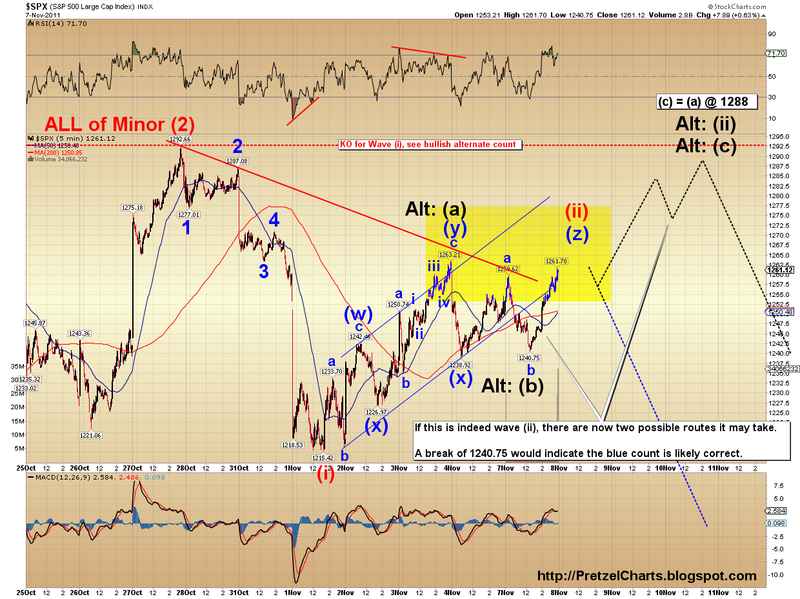 If that resolves to the upside, it would line up nicely with another wave down in equities. Wow pretzel, were you responding to my comment on the dollar, or did you just happen to be on the same frequency at the time? Green, I was responding to ya. lol they must. i feel like i've cheated on you. don't worry, we can still be friendsss! These charts all makes sense to me, Pretz. And yes, they do look like a LOT of work. Amazing. That Nasdaq / NYSE indicator certainly speaks volumes. The highest ever recorded. Not surprising, given the over the top sentiment one can find just about everywhere at the moment. It's a bit unreal. Today certainly looks like it'll be a strong day up on all of that exuberance. CNBC's tone and coverage is (predictably) positive, as are the news headlines. I do wonder how many more longs the Street will be luring into larger positions this week. And at what point will the market reverse and the Street goes decidedly short? I still share your belief that that moment can't be too far away. And am now wondering if the bear crowd is actually just fine with letting the market head back up to the October highs to short down from there. If they were just as surprised at the November decline as the rest of the market was, then they may want the entry opportunity back. Sounds like the next few days will tell us an awful lot about what to expect. Yeah, I'd definitely welcome a crack at adding shorts in the 1280+ level. That wouldn't hurt my feelings one bit. I'm really interested as to what happens next; this is the first time CTP and I have been on completely different pages (at least, in the month or so I've known him). He's looking for a big Santa rally now. Well, Apple KO'd its blue wave i down... so Apple is likely in the green alt. count on that chart. I just don't see that resolution to the upside on the dollar. At least nothing sustainable above 77. Its recent spike came after the bank of Japan took action on the yen. Not much bullishness on its own, despite the Euro mess. Continuing to drop steadily this AM. Yeah, it might be a wave 2 down in the dollar; in which case it probably won't find much support until the 76 level. 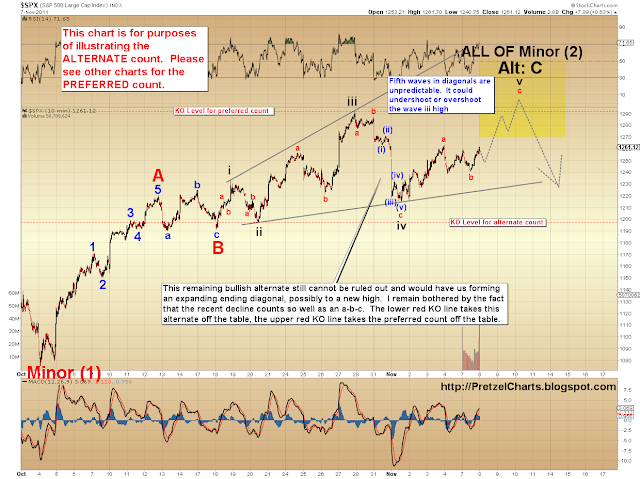 If that's the case, we might get the bullish alternate in equities. I'm interested myself to see what happens. And CTP's strong reversal is curious to me. Apparently a cycle not coming through as expected (if that's what this is) carries a lot of weight with him. It's helpful to know here are also so many concrete and measurable indicators showing exactly that though. Too many to summarily be ignored. With the gap up today, there's no point in exiting my open positions (which are more than manageable) until I have a better idea what direction the market is taking. I can wait until tomorrow to make a more informed decision. Mostly likely I'll be going in short a lot further than I am right now at some higher level. The 200 dma now hangs just five or so points overhead. I certainly wouldn't be surprised if we see it (and then some) by the end of the day, with bears being more than happy to let the market climb up there without much resistance. Will be curious to see if the bears mount any defense from there. It seems to me that, for the market to keep rising here, huge quantities of traders must be suspending disbelief about Europe etc. (in denial might be a better term). Of course, as the saying goes: the market can remain irrational a lot longer than you can remain solvent. btw, SPX just hit the first level where bears might consider mounting a defense. I went back and re-read CTP's latest post. A-B-C pattern, huh. With C being the 'Santa Rally'. Okay. And simple enough. That would mean over the top optimism through Christmas time. More improbably and irrational things have happened in market history, I suppose. Ty, William. That indicator has served me well over the years... we'll see how it does here. The dollar seems to have bounced off its low of 76.591. If that holds, which it looks as though it will, the SPX might not even break 1270 today. A sign of faith in you Pretzel: I closed out one of my long positions left over from my buy and hold days. Hey, where's Frank and Rocky today? Brian, yeah. He's looking at the Oct. high as A and this decline as B. That's pretty bullish over the IT. It's not impossible, but I have a hard time wrapping my head around it right now, given the extreme overbought nature of the market here. As I said yesterday, I can see a Santa rally -- but I think it needs to start from much lower levels. I'm still at about four times cash what I have invested. Because yes, the market's irrationality can outlast and overwhelm the best-considered trade. I've learned that more than once. And yesterday's foray with SPY puts was calculated with a SIX trading week window to at least get to break-even at 1,245 or below (and that would mean going all the way to expiration for the time premium to be that far gone). Seemed like safe odds to me with a lot more upside possibility than downside risk. If the market never makes it back below 1,250 for then next six weeks, well then that'll be one the more surprising things I'll have ever encountered in my investment life. I am hanging around here just watching the tape, studying my watchlist, etc., etc.. 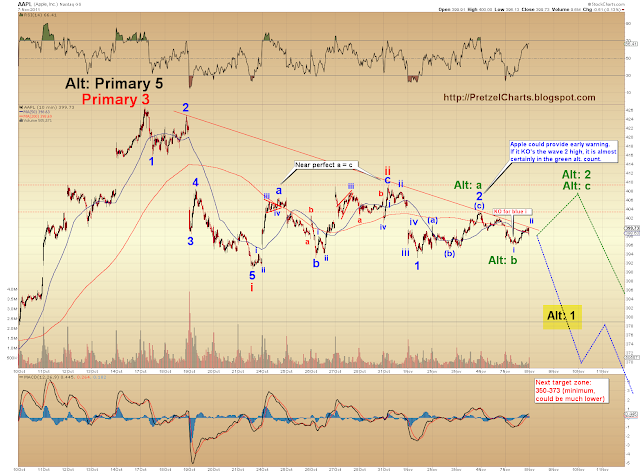 I see that ABC as a potential, but to complete the B wave in 2 days of trading just seems odd. I really thought we needed to test 1190 once before rocketing to new highs. No matter how you slice it, I can't see this rally heading more than a little bit higher without going lower first. Bulls used a lotta juice to get here... gotta reload somewhere along the line. Unless this IS a new bull market (cue ominous music). This market is frozen...like it's waiting for a news story to break. If this is a NEW bull market, can it be possible since we haven't technically had a bear market? I know this is not your prefered count yet. Just food for thought. scottrade keeps freezing for me. Is this happening to any of you guys? Are you using Scottrade website to trade or the Scottrader Elite software? Mine seems to be ok. It's not a new bull market LOL - we've been in a secular bear market since 2000. It's just a bullish rally inside a larger bear market. The freakin s & P is still at the same level it was 10 years ago !!!!!! Well Frank, if we haven't had a bear market, then it can't be a NEW bull, lol. I just can't see it happening. I'm not shut down to the possibility -- but the onus is on the market to prove that one to me. If this is a bull market starting, sentiment should be in the dumps, not at all time highs. pretzel - any quick interpretations of this mornings price action? or just another hot mess of randomness? Vulture I agree, but I do consider the B wave off 2009 to be a cyclical bull. It's all relative. The last low we had was really no shake out at all. The VIX only made it to mid 40's and volume stunk, it was just an orderly sell off. What you need for a real bottom is the VIX hitting 60 and everyone running for cover. That's when it'll be time to go all in long. Rock, looks like a promising start, but they need to punch it down through 1255 and sustain trade under that area before it really starts to mean anything. Right now, could just be a routine backtest of the top of the trading range of the last couple days. So CTP bailed out of the bear. Interesting. I haven´t. I see a major turnaround before the end of this week, the start of major verylongterm grandsupercycle wave 3 down. I alo do not opine that tere will be any santa claus rally this year. 2007 did not have one, and neither will 2011. The more a rally is taken for granted to be complacently expected, the less chance there is it will occur. There will be days where it will seem to commence, however, the major trend will be strongly down, for the rest of 2011, starting any day this week. But before that, there wil be an overthrow climax up move, to wipe out as many shorting stops as possible. And then, next day--major gap down, buying exhaustion. This week. I can go into furhter detail, but I won't. Suffice to say the "powerful rally" has been down on less and less daily volume, especially with it's weekly leader, the senior gold stocks. Gold has reached major resistance, in low $1800's, plus silver is still totally dead, churning in the $34-$35 area, and $36 is major resistance, which conntinues to hold. I still see silver as the best percentage play downward, starting this sometime week. So I am sticking with it. IMO, some "news" will come out of "nowhere" this wee, and change market sentiment radically change, downward. And I have a strange hunch, these "very bad news", will come out of the USofA, and not Europe. Therefore, the USA market will cease to outperform the rest of the world markets, as it is still doing right now. Final point: if you look at late2007/early2008 closely, daily, even intraday, it is uncanny how much it parallels 2011, from their multimonth h&s formations, onward. I am sorry to break this to you Pretzel. 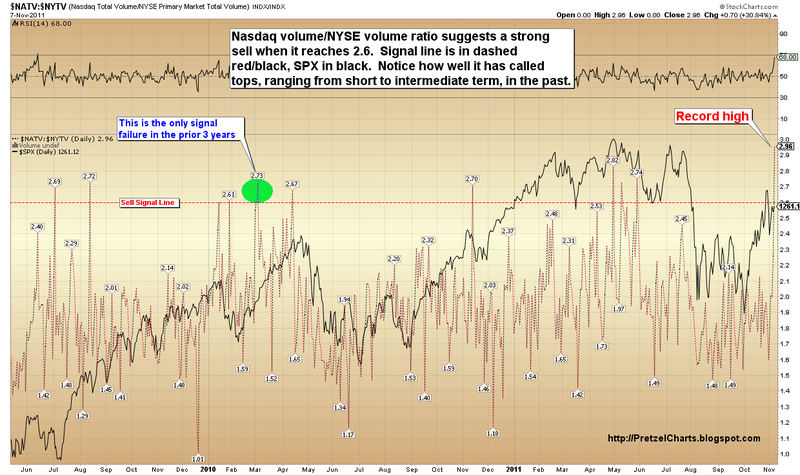 I religiously watch the NASDAQ/NYSE volume ratio and noticed that spike and thought it was bearish. But herein lies the crux of the matter. When it comes to trading, you generally want to be on the other side of whatever I am doing. You see what I am saying :)! No EW or any other indicator can overcome my fadelicious powers!. I agree that the complacency right now is startling, and also agree that too many are "expecting" the Santa rally... which usually means they already front-ran it. Nice to hear from you. Wish you would go into further detail, should you feel led. I appreciate the differing views, as long as all post practicing "non-violence." hahaha! J - what level are we looking for to get a push down - 1255 and below ? LOL, I was thinking that. Well, now the decline is starting to look more promising for bears. If bears can punch it through these levels and step on the gas a bit, we'll have what looks to be a nice whipsaw out of the trading range. I'm watching DJ30 volume - only index I can see intraday vol on. For the moment it looks like the volume has been increasing on these drops, unlike recent days where the sell vol would wane off. The level that's critical to the bull case right now is 1240.75. That's the key level they have to hold. If we break that, it guarantees that the wave we just topped was not 1 of a larger C up. That would lend a lot of credence to my view that it was C of (z). any real news coming out now that is causing the drop? To give credit where it is due: I thought your recent post was fabulous. Your reasoning is certainly sound, coherent, and insightfully argued. And your editing is about as careful as mine, lol. We don't have the obligations for formalities that Pretz has. The Christmas rally being front-run and too 'complacently expected' certainly sounds 'right' to me. I've been of the general expectation that we would see a Santa run up myself, though I never pretend to be able to see out that far. Especially in today's environment. And I have figured that the best case bull scenario for an X-mas run up is another significant leg down, so that the market has a place to run up from. A climax move up to take out all stops certainly sounds plausible to me as well. I have none set on mine (partly for that reason), but mostly because I just don't believe we'll see higher than 1,275 for very long. And I also believe we'll see below 1,230 (and probably far lower) on any whiff of bad news. And with the S&P down to 1,256 as of this writing my positions are back at around even (SPY puts at an average of 1,258 on two separate buys from yesterday). Your bad news story fits with my theory about the news as well. When it's time for the market to reverse course, they get printed and talked about on CNBC. And right now a bad news even from the US would catch everyone rather flat-footed and by surprise. The reaction to THAT would be kind of funny to watch. Not wanting mayhem to break out across the fruited plain here, but we are currently perched at a (relatively) high place from which to descend. I'll look forward to your 'further details' myself. LOL, not a lot of love for my article today. Got 3 "good" and 1 "marginal" and not a single "i like pizza". Wonder who didn't like it? Probably either a bull, or a bear who thinks I wasn't stern enough. The Oct 4 low reversed with 3 white soldiers and took us all the way up here to the 200 day MA line... After 10/31 and 11/1 which dropped two black crows, I was hoping there would a third black crow coming.. that would have been so classic and a pattern like that you won't see in a 100 years.. Well two black crows is not in the text book but still looks pretty ominous. why is the bounce off the 1255 level important? One thing that certainly crossed my mind this morning: the HOD close yesterday, the overnight and morning positive spin cycle, trending higher futures overnight, then the gap up open and no major resistance shown in the first half hour of trading . . . it's ALL JUST TOO COHERENT AND OBVIOUS AND PAT. The market was practically shouting out: We're going to 1,275 by noon today. But when do the market indicators all line up so blatantly obvious like that . . . and then deliver the goods? Not often in my experience. We may yet see an afternoon run up and newer highs later in the week. But this all looks way too telegraphed in advance. Yesterday the early morning negative reversal came down hard and formed a little ledge and dropped further but ended in an afternoon positive reversal. I am wondering how the script is going play out today. Looks like the same thing? Anon, if you'll scroll up, you'll see that much earlier I mentioned it as an important support level. The market is acknowledging that with the bounce. What happens next determines whether bulls or bears win the battle at this level. pretz, I like your "volume-index". Volume is one hell of a reliable indicator as Volume always precedes price -at least for individual stocks; not sure how it does on a composite, but probably same principal. As I mentioned on CTP's blog: volume has been decreasing over the last 3 days with increasing price: thus expect a decline or more sideways action (how much longer can we go side ways... ugh). I just check bollinger bands on S&P and on a daily scale it's leveling out with price-action around the MID. On a weekly scale price action has been hugging the UPPER for quite some time now and the lower band is leveling out: high-volatility and time for the price to go down to the LOWER band. So I remain of the idea that short-term is bullish, longer-term bearish. Pretzel, this is a fan letter. I just have to give you my most humble appreciation for your work on this blog. I was totally uninterested in shares and the stock market, until a few months ago (strangely, in connection with my meaningless securities lost lots of value in August and I became interested in what the hell is going on), and then I found .. you. Now I'm at your blog several times each day just waiting for new charts, and my understanding is increasing slowly but steadily, although I now also realize that I never could understand the stock market to the fullest. It's a monster. - DOWN BOY, DOWN! That it will take such f'''''g time. down to 800, where should I pump in my piggy bank. My invitation to you - never stop writing. from the fundamental viewpoint, seems like the market wants Berlusconi out, and is a bit disappointed this morning that he is still in power. when he does resign, that may be a catalyst for a leg-up. Thanks Anon DJN73! Fan letters are always appreciated. yeah, seems like it could. This news-driven tape is another thing that reminds me of 2007-2009. And this after the motion carried unanimously with ONE abstention?!?! I'm afraid that is what happens when the only thing you can predict is the past! Btw, with the "you" I refer to the talking heads, not TJN! Bears still have some work to do... right now, the decline looks like an a-b-c... but if bears can turn it here, and punch though 1255 w/ some authority, then it becomes a nested 1-2 with the next wave down being 3. Too early to tell. Bears likely need to hold it below 1265. With the bears staging a defense 1260, is anyone going/adding short(s) here? Thanks again Pretzel and enjoy the well deserved rest. I'll try and help defend the trenches in your absense! I go by many personal 30-year experiental measures, but mostly by extreme sentiment, same as PL, during major market turns. 1. AAII sentiment, bulls minus bears, is back at circa 20, same level as in late july 2011, right before DJI dropped 2000 points in 2 weeks. 2. EWT FREE reports: "Despite the recent market decline...the bullish bias of investors remains solidly in place. ...this condition is readily apparent in the ICI mutual fund cash-to-assets ratio, which hit a 50-year record low of 3.3% in July. The torrential selling of early August barely reversed the needle, raising the ratio to just 3.4%." Also, EUROSTOXX 50 is doing poorly, in comparison to the DJI, and I am of the opinion, that the USA large-bank fundamentals are just as weak (if not worse) as the European ones, so major USA banks (and all large-cap stocks) have to still drop quite a lot more, just to catch up to major Eu banks, and Eu large-cap stocks. As there were laws passed on march-april 2009 in the USA (that no one seems to give any importance to anymore, but THEY WERE, IMO, THE MAJOR event that ignited and fueled this current WAY-OVEREXTENDED short-covering BEAR rally), laws that allowed banks NOT to have to publicly (by independent-audit), quarterly disclose the MARK-TO-MARKET valuations of their asset-mortgage portfolios (and neither their juiced-up xxxx% CDS DERIVATIVES, whose true valuations are still a mystery to 99% of the population). To be brief about all this, all this multiple large-bank covertness, about their TRUE worth of their owned mortgage "assets", is an bigbank-INTERCONNECTED ticking hydrogen timebomb, that will chain-reaction explode very soon, IMO, as further and further banking debt-due "revelations", are made worldwide. Therefore, personally, I see thousands of points of DJI cut off in chunks throughout 2012, with each additional (no longer possible to hide) "discovery", adding to the shocked, gutwrenched faces everywhere--and some of them looking for tall buildings, to jump from. PS-- I learned long ago, bull rises do not need panic falls, to die and turn bear. they just need to get tired. just exhausted. no more manic thrilling "buy stories". thus: no more buying. Then the bear starts with just slow, lazy selling. And that's all that's needed for an old bull to roll over. a gut panic grows more painful, inside each bullish investor. and then more begin to sell, even breaking easily support levels. Then, it quickly becomes--a selling frenzy. So who knows, maybe today's +1271 top, might already be it. Breaking News: Minutes ago, gold just crossed over 1800 dollars, and silver just rose slightly over $35 dollars. 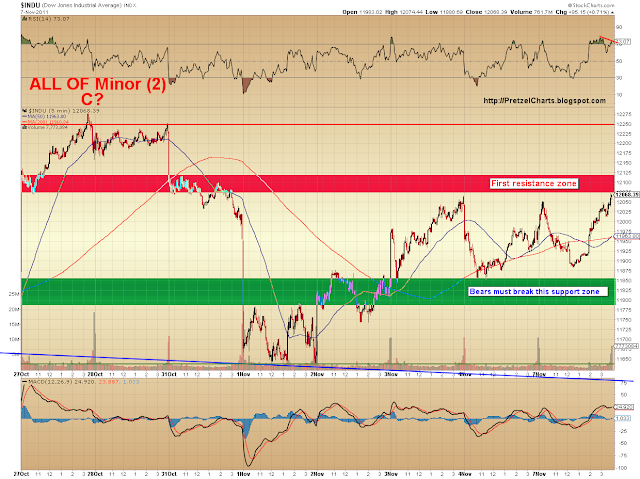 Both major resistances areas. If my bear theory is correct, both areas should hold, and turn heavy bear this week, along with the DJI. So today might be the top of wave(ii). Man, can the market stop moving side-ways, pleeaassse ??? it's driving me nuts. I can't find any good point of entry. went all cash early last week and that's where I still am. this is nerve-wrecking. still of the humble opinion that 1285 ain't gonna be cracked anytime soon. Haven't we seen this pattern before? Right on cue, the post 1:30 PM bull rally starts. The dollar is braking down as it has every afternoon. The stronger selling volume of today, gave out about the time I referenced it - and the bullish volume picks up as it has every day recently. Who would have thunk? Dollar just broke and made a new low 76.559 since peaking on 11/1. Having violated that low, there's more room below - enough to hibernate the bears. Looks like a tough climb back up at any rate. I like the sideways movement for the bear case. Bulls running out of ammo with each passing day? And sentiment about as peaked as one could ask for. And what are really nominal and hard fought gains. We may go through an entire cycle with a move of fifty-three points from the low to the high (1,218 to today's 1,271). Where's the next few hundred billion in new investor cash going to come from that would sustain us past the October high? And which would be required to keep us above there and hold off any major bear re-entry? Uh, nowhere, remains my firm opinion. Most of the new cash that's going to be in the the market for equities is already in it. And at this excruciating pace upward, at some point the MM's plenty have TIME to get into fresh short positions at these levels. If you are THEM and you are staring up at 1,300 above (thirty points and a whole lot of new money) . . .
. . . which outcome seems a whole lot easier to get to? And especially from where we sit now? 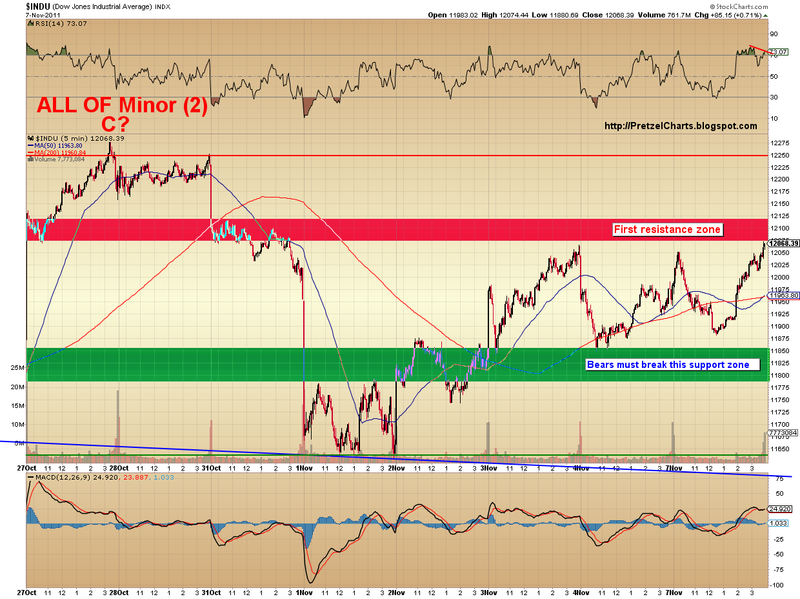 Short article on Minyanville today about the dollar set to rally after consolidation. Which is in line with Pretz's working assumptions. If that happens (even with no negative news event), equities probably start to move down on their own weight. This at least certainly would not be good for equities. Perhaps I am simply talking myself into (meaning rationalizing) my own hypotheses, but there are too many confirming indicators pointing to a likely and logical outcome. If the market takes a week or two longer to get there than I am expecting, that certainly wouldn't trouble me much. It's quite often catching up to what I conclude. And other times arriving there sooner than I thought it would. Still working on getting that timing thing down (which is why I always set my option buys with a four to six week time window), but that's what Pretz is here to help us with, right? Okay, I just posted above not looking at afternoon market action. Dollar breaking down again and buying picking up again. Hmmmm. So much for my investment hypothesis. Are there any more European leaders left ready to step down in the name of the new bull market ???? Sarkozy ? Zapatero ??? Who else will fall on the sword to keep up the buying ? How many EU members are there ? This could go until spring !!!!!!!!!! Shooting up from a bullish flag.. oh my goodness... irrational exuberance? Burlusconi resigning makes the market do an f-ing cartweel and back flip? Are you f-ing serious? Let's all max out our margin accounts on Italian bonds and throw darts at the WSJ to pick equities!!! They're all going up FOREVER now. You can take it to the bank. And who needs the dollar for anything anymore? Let it rot. Let's all jump on the Bernanke bandwagon and short it into oblivion for good measure. I'm sure it'll never see above 77 again. Nor will the world ever need for it to. The Euro is what we'll all be using soon enough, what with their banking system and governments being so solvent and safe and all. Are we getting to max euphoria and nonsense buying yet? This should be a sell the news event if there ever was one. But with the way the market is acting, who knows maybe this continues on for another few weeks. There is only one Italian that can save the bears, only he is dead - Fibonacci. The 78.6% retracement is at 1276, within arms reach. We're going to close higher for the fourth time in seven trading days since the first big drop. Its hard to ignore what that means for both the bulls and bears. I plot acceleration bands and the SPX just pushed above the upper band this PM, we've had at least small pullbacks when that happens, even earlier this AM when we moved above them on the hourlys. Makes sense, Green. And it is what it is. For as much as the markets have bounced recently, the EURUSD cross hasn't really tracked like it has in the past. Maybe I'll top tick this. I'm out. Too hard staying short. Best of luck to all. Hm... perhaps the market does turn into a bull market... next we will see Obama getting kicked out of office and the beard resignation sparking a furious rally on the SPX :-)? Gotcha! What a great place to enter on the short side? Problem was that when I looked behind me I saw I ended up as (almost) the last bear standing... So I lured the Bull to Green of the 1276th Brigade where the two of us finally slaughtered him!!! We need a buying climax... getting there soon? Handing brave bears a potential profitable entry point... The mere fact that (almost) everyone is now bullish should be proof enough that the top is probably in. From CTP to that last Anon who bailed at 1276 everyone is buying the baloney that this market can only go up from here. Of course anything is possible, but is this really what TA is telling us here. Anyway, I'm no expert so I'm looking forward to hear Pretzel's take on this when the Sage awakens to find the market didn't quite make it to 1288, but closed exactly at the 78.6% retracement a la Green. Will wait to analyze the day, hear from Pretz, read a few other perspectives, and weigh my options. But I'm leaning toward going in much more heavily short when there is a clear indication of the market topping out and headed for a reversal. Will be very curious to look at sentiment indicators after the close. So let me get this straight: The Italian bond rate goes up near 6.75%, they're debt load is unsustainable by any measure . . . but if the PM just resigns, that is cause for taking U.S. equities to new cycle highs? Uh, WOW! This is the very definition of euphoric and senseless buying on the silliest of news developments. News organizations can clearly can get people to believe just about ANY reason to buy stocks. And this has created a rather opportune entry point for MM's and Street pros to position themselves short. Looks like all stops to the upside got taken out today. Wonder where that leaves the bear crowd from here. this market isn't paying attention to technical levels for reversal...too many bears are watching those so it won't capitulate on a technical level. I'm learning that. I'm throwing in the towel here, so it's free to gap lower tomorrow on cue. this just doesn't seem/feel right; why should an american stock-market based on company performances (and thus future earnings expectations) be reacting to a sleezy Euro-PM resigning or not? That will not do anything for any companies' earnings, thus makes no sense, feels like a hot air balloon ready to pop any time soon. Third day with EXACT same pattern too... Looks over-bought to me and feels like a short-squeeze every single time at around lunch time. Go figure. Either that, or the market just needed to go a little higher and the talking heads needed a story to try and explain it. On the flip side; had the market tanked today, the "record bond rate" coupled with "Italian PM's possible resignation" would obviously have been cited by the same "experts" as the reason for going down. That is the beauty of being a market analyst; you merely have to connect the most obvious dots - of course ALWAYS in hindsight! Put differently, if ALL these "news" developments of today had been available yesterday already, how many of these "experts" would have called today's tape action correctly? I actually find it fascinating that almost everyone also seems to believe that today's "news" had anything to do with today's market action. Can I really be the only one here who believes the news events play almost NO role whatsoever in all this? After all, if the 'real world' played any role in market price action, the S&P should have been trading somewhere south of 1,000. And Italy's bond rate would have provided an additional wakeup call. That and the growing political uncertainty in Europe should have put fear into those still holding on to their longs in the stock market. The same "uncertainty" that normally provides a "usual suspect" to analysts on "down days". Ugly day, boys, and here we are just above the 200 dma. And we touched the top of Pretzel's yellow target box for the SPX. Does Pretzel raise his 30% odds? Still a good chance for the bears? I won't trade when the US markets are open any more. Not for a while. Overnight future only for me now. There is no rational nor technical explanation for today's trading. When bears boycott the intraday action then there will be nothing left to squeeze. Then Wall Street will have to figure out how and to whom to sell their inventory of garbage equities. If the past is any guide, taxpayers will get stuck with the bill. They found their last set of suckers in the market and their names are "Bears". I sure hope that Fibonacci treats Berlusconi differently than what happened today. If this is going to turn around then this is a natural place for it to do so. A few observations, the 61.8 Fib level was significant. It was the HOD on Thurs, and was the first time the retracement rally moved above the acc bands I plot. A good pullback followed on Fri. We remained below that level until shooting through it today. The pullback from 1271 was the next time SPX moved above the upper acc band, from which we pulled back slightly only to rally into the last hours. Not only are we at/near the 78.6 level but we moved above the acc band again. Last time that happened coincident with key Fib level saw a 22 point pullback. One other observation of interest. Today's DJ-30 vol in the last two 15 min periods (bullish) was the lowest in the past week - roughly 40% lower than previous days. The bulls late push is losing its punch. And I agree Brian/Jaco about the mkt reaction to the news. Well many of the posts found right here do suggest the optimum and zenith in euphoric bull sentiment is either here or fast approaching. Bears giving up and turning around to go long at market high points (or abandoning the market entirely) is the corrollary and counterpart to bull-buy-anything euphoria. When was the last time everyone, including bears, were thinking that the only way forward is up and up and up? And all forms of resistance will be shattered? I remember the summertime being rather too full of nonsensical and naive positive sentiment, but this strikes me as an extreme sentiment wave cresting even higher (bad pun intended). And this is now also seeming like the market top sentiment corollary to the fear and despair found at market bottoms. It's palpably discernible. You can FEEL it. And it's clearly not sustainable or rational. One thing that today made certain: There are few stops if any left to take out. Bears are out and holding cash right now. And we still haven't gotten past 1,280 yet. Critical levels to defend for a full out and unqualified bull market have not yet been breached. Or even tested. I do want to hear Pretz's take on the V shaped mid-morning reversals the past several days. An essentially identical trading pattern three days in a row in the cash market. How often does that happen? I'm going to try something different, I'm going to try and predict the Pretzel and his take on this. My prediction, is that he will say that we're right on course and where we should be, albeit maybe slightly off schedule. 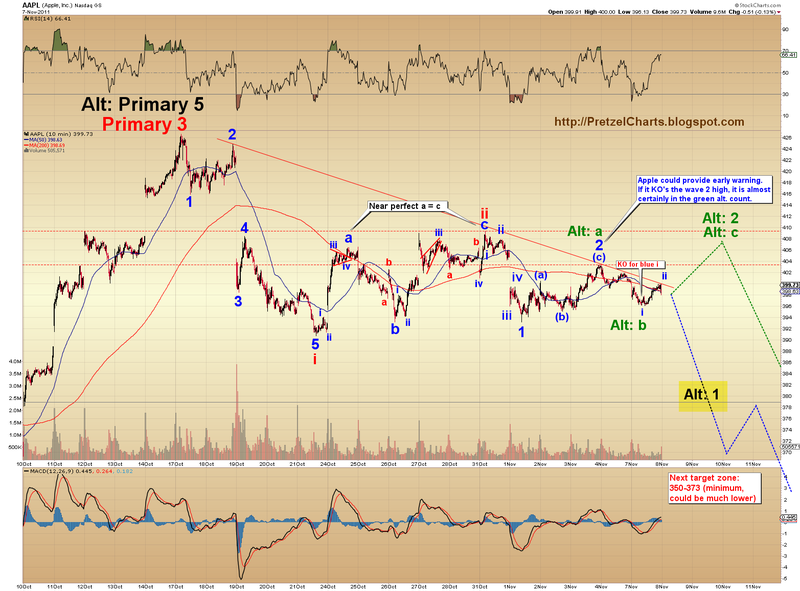 "I do want to hear Pretz's take on the V shaped mid-morning reversals the past several days. An essentially identical trading pattern three days in a row in the cash market. How often does that happen?" We are educated to buy the dips... but one day there will be no reversal. "Bears still have some work to do... right now, the decline looks like an a-b-c... but if bears can turn it here, and punch though 1255 w/ some authority, then it becomes a nested 1-2 with the next wave down being 3. Too early to tell. Bears likely need to hold it below 1265." Just glancing at the charts before I head into town for some things, I would still favor my 1st alternate count over the 30% "bullish" count. Today's marginal new high is loaded with divergences -- doesn't look like the start of a third wave up, which is what bulls want it to be. RSI divergences on the new high from 1 min-60 min time frames. Nixed my trip to town to look at charts, so I'll be around for a while. Pretzel, do you see any reason (other than some headlines) that the spx shouldn't find atleast 1285 here? I'm thinking any AM lows are a short covering op until we see 1285 atleast. 1275 just doesn't seem significant enough to be a reversal point. I'm glad you came back this week (as long as you and brian can continue to refrain from stabbing each other to death, lol), I find your posts to be insightful and valuable contributions. ty for sharing. do you think this can be just an overall correction to the pre august fall? Based on the muddled gunk in the charts, it's tough to say. But my 1st alternate has now become my preferred count, so 1285 is a reasonable target. I'll have to dig further into the charts tonight to have a more informed opinion. There's always the chance of immediate reversals when we get this close to targets. Today almost looks like a blow-off short-covering panic at first glance. Seems like the market wouldn't get this close without filling the whole gap -- but the one resistance point that *is* here, though, is the Wave 1 bottom at 1277. A reversal in this area would catch everyone by surprise again. The Oct. 27 high is really the main significant level, at this point. That's the next key level I'm watching for clues. Only 1.3% up from here. Are you asking if this is a correction to the bull run off march '09? That would imply monster new levels in the market. yeah definitely. I wanted to close out my shorts today and maybe go all in cash. Alt count was what I was thinking you'd say. Will be curious to hear your answer as to what you think we'd see happen if that one also gets knocked out and we are then left with only the bullish count left standing. 1,292 is now just around 15 points away. If bears don't reverse the move up soon, maybe the bull run forever and no one can stop us notions are actually the *rational* ones. And then where would you think things go from there under that scenario? Do we all get to live in a faerie land of the Perpetual Bull Cycle, where all bad economies' equities go up and up forever and ever? And bears are never allowed to any parties anymore? I must admit to feeling more amused and curious than troubled by the last few days' trading. Feels like we are witnessing a curious market episode unfold. And it's not like this has been 250+ point Dow up days. But I do understand how this interminable march upward (and after seeing one morning down leg after another get laughed off by longs by noon) can destroy by degrees the confidence of bears, while simultaneously reinforcing sheer delusional confidence for longs. Which seems to be where the market finds itself now. I don't know if you noticed, but I said nice things about Anon20's posts. Which I meant. Genuinely. His market insights and perspective were never in question to begin with. And it seems we have more in common there than differences. Though I would never expect him to acknowledge that. Really and truly, this is not trading advice, especially since I don't think most here trade like I do... I jump in and get out FAST when the market isn't completely transparent to me -- so when I take a loss, it's 3 points here, 8 points there. When I take a win, it's sometimes 2 points, sometimes 20 points, depending on what the market is doing. I don't take long-term positions unless I have a really clear grasp of the trend. But the times I've gotten stuck in a draw-down situation, I always think this way: imagine one had been in cash the whole year so far. Using the current market as an example: as the market approaches resistance from the last important swing high, but hasn't yet broken that resistance -- would you be looking to get short here, or go long? Remember: you've been in cash the whole time, so there's no pain or emotion. A test of resistance is coming, and the market is over-bought. Rationally, which side of the trade would you take right here? And where would your exit be if that trade went against you? "Do we all get to live in a faerie land of the Perpetual Bull Cycle, where all bad economies' equities go up and up forever and ever? And bears are never allowed to any parties anymore? And what becomes of your fan club under that scenario? LOL"
If the market starts showing real signs of being in a new bull run, believe me, I'm going to trade it like it's a bull run. It's all about the charts for me; so even if I "think" the world is going to hell in a handbasket, if the market is behaving contrary to that view, then that's how I'll play it. Right now, though, all we have a big rally in a bear market as far as the charts are concerned. Oh, and to the other part of your question, brian... if the 1st alt. gets KO'd, the remaining alt. bullish count isn't that bullish really. Just ST bullish. But we'll burn that bridge if we come to it. All I can draw projections from is what's in the charts *today*. Things can look very different tomorrow or 3 days from now. Heck, 2 weeks from now, we could be at 1140 and all the bears will be kicking themselves for closing their shorts, and the bullish alt. count will be just a bad memory. True enough. Was more just wondering aloud. Will look forward to your next post and round of charts. I only have to get back to my average entry of 1,258 at this point and we have plenty of time, so I'm not too worried. And if we are going to have a run up in the meantime, I can still trade that too. And jaco, I see now that the afternoon rally was all your fault. There's no steak in the trenches, soldier! Bully don't eat steak, he eats BEAR. I guess I didn't do a very good job of being the oracle of Pretzel. I wasn't expecting the quote below. "But my 1st alternate has now become my preferred count, so 1285 is a reasonable target." Reason I thought you would say everything is right on course but late, was your charts and write up on Thursday. 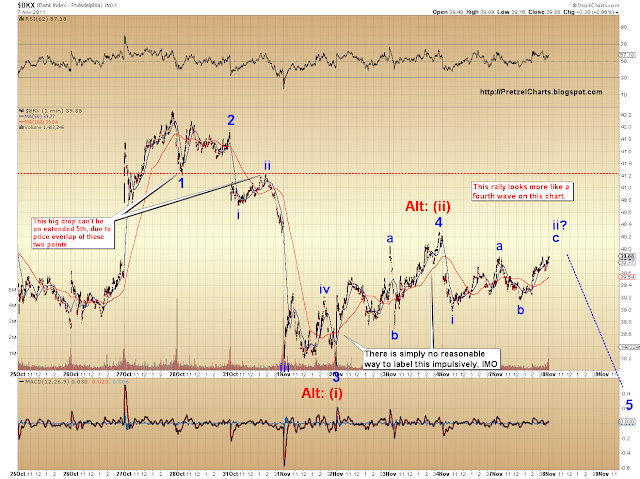 Your target for wave ii to conclude or reverse at that point was a range with 1277 at the high end. I'm not clear on EWT, but is the change because the target didn't happen by the 7th within the yellow box time frame? It's more to do with the wave structure. When the market adds more structure, it can alter targets. When the structure is super-clear ST, IT, or LT, I can sometimes nail the turn within a point or two, like with the weekend chart, where I had it to pennies (that was based on ST structure). It's just not a clear structure right now. In the grand scheme of things, though, 1277, 1285, 1288 -- what's the difference on a daily chart? Nothing really. Brian - my avg entry is right around 1258 as well...so I feel your pain man. Covered some of my shorts on the close today, just wasn't willing to eat a monster gap up if we had it, but I'm going to hold this position at least until we give 1287 a try. A 1293 print and I'm outta here which is probably the MO for a lot of bears at this point. 10/27 had to be a bear capitulation...do we really need another capitulation to turn this market lower? seems a little far fetched. Since when did we need 2 capitulations to make a bottom or a top...I thought those came in ones. Rock, just judging purely by the posts since Oct. 27, we haven't had bear capitulation yet. Honestly, this is the one and only semi-decent sentiment argument for new highs. Looks like we may be getting there, though, as far as capitulation goes. pretz thanks for your words. I also understand wholeheartedly that this you aren't giving trading advice so no worries. Bear capitulation, huh? Wonder if all bears and Street insiders will feel the same way if we do cross 1,285? And at one point would Street sentiment turn back to going short if bears do give it up to the bull stampede near term? if your post on a-b-c was for me saying "no technical basis" I just want you to know I wasn't bagging on you. I was trading ES intraday when the "news" broke and all the indicators said down prior to the pop. Same as day before. Then goose-goose-goose to higher highs with a crap load of divergences piling up (as you observed). Can't say that I would support any assertion that the last 3 sessions are just normal noise as we carve out normal patterns (I am prepared to be convinced otherwise). It is more like an ambush each day. In that last sentence, I meant 'at what point' does Street and retail sentiment turn back to selling? I don't whether I should long or short after reading your latest articles. I'm clueless, so are you. Market's at a crossroads, of which I am leaning toward a downside resolution, as stated in virtually all previous articles. Also if you can't deal with uncertainty, then trading is probably not a good choice. Better stick to a 9 to 5 steady paycheck, and let your broker handle your account. Good answer to anon, Pretz. Though I do expect you to nail the SPX price at 10 am, noon, 1 pm, 3 pm and then the closing bell tomorrow. And within 3 points at each juncture, please. That's not asking too much, right . . . ? You don't always "have" to be long or short, and your presupposition that it *has* to be one or the other is erroneous, and is the source of your confusion. The idea that it's even possible for my analysis to continually and definitively indicate "long" or "short" is not in line with the reality of the market. Sometimes all I can tell you is "market appears undecided, but here's my best guess anyway" which is exactly what I did yesterday. I further stated in the article that front-running the move isn't something I would necessarily do right now -- which is a recommendation for the third position a trader has at his disposal, and the one you ignore: cash. Unless you're a nimble short-term trader, in markets like this, "flat" is often the wisest position. Besides the logic of the sentiment indicators, I can't shake the feeling that the top is REALLY close now. The last time bears had this much angst was Oct. 27th. Unfortunately, there will always be haters. The rest of us appreciate the work you're putting in Pretzel. Interestingly, there's at least one way to view that charts that says today WAS the top. Hmm. Still working, but that's showing across markets I've checked so far. THE charts, not "that" charts. Blogger, give me an EDIT option...! Hang in there Pretzel, often times I get lost counting waves and get all confused too. After following your blog for a while my EW understanding comes down to 12345 ABCXYZ ... He he.... But I appreciate your scholarly work truly. Keep up the good work! Just out of curiousity, when you say that, how bullish is "bullish"? Bullish ST, IT, or LT? I'm sure there are plenty of anonymous such as myself who really do appreciate your time and efforts. There's always a few ungrateful ones but I bet they're the exception. Thanks Pretzel. I appreciate you too, Pretz. Thanks for your incredible generosity in doing all this work and sharing it with us. Thanks mav, and anonymouseseses ("anonymi"?). Don't mistake your individual detractors for being (even remotely) a proxy for overall 'sentiment' concerning how your work is generally and widely perceived. Your responses (that I have read) are telling, starting with your extended defense of your article on Minyanville the week before. That critic went after the emotional and philosophical underpinnings of your work, if you remember. While also (predictably) calling into question whether you are competent at the whole E wave thing in general. I'm another "appreciator", Pretzel, and I particularly respect the "ego-less" manner in which you conducty your analysis - something that many traders fail to do, at their cost. I'll be more careful, I promise. I see South African JSE started green and turned solidly red during the first hour of trading. German LFO index data coming today - may suggest Germany entering recession. Yield curve inversion has now occurred in Italy portending recession. Euro zone recession looking increasingly baked in. Absent the ECB reversing course and printing (which they surely will, eventually), sovereign EZ yields will come under greater pressure as recession bites. Ty, both (or the same?) anonymi. Great report on a fundamental wake-up call for the markets. That might trigger what I'm seeing in the charts here. "Interestingly, there's at least one way to view the charts that says today WAS the top. Hmm. Still working, but that's showing across markets I've checked so far." This is what I was referring to. After comparing across markets, it checks out. Top may be in. More in tomorrow's update. Be interesting to see if they can reverse this before the open. They've reversed it the last two times and brought it back to flat or green before the open. This time, though, I suspect that might not happen. When I see something like that I just want to shout: "You sound surprised!? Helloooooooooooo, where had you been the last few years?????" Don't wanna sound too excited yet... but THIS is how you kick off a third wave decline, with a 20-30 point (or more) gap down in the market. Me too, I don't want to count my chickens yet, but my VERY short portfolio is already -2.3% on the day.... Bring it on! Pretzel - are you trading these futures right now? Hypothetically of course? btw, whichever anon is posting the fundamental updates, I really appreciate it. It's hard to watch everything when I'm charting, so these bullet point updates are quite helpful. Tomorrow's update is now posted, so let's move future discussion over to that thread. Hypothetically, I might be short, yes. I might have gotten short right about the time I told Rocky that the top looked like it was in. If I were trading, of course, and not speaking hypothetically. Looking at my hypothetical entry level in my hypothetical trading account, it looks like I am hypothetically short from 1271. Which means I am, hypothetically, a pretty happy camper right now.